Every year KYAAT undertakes a specialized dance workshop to enhance learning. Being an exponent and teacher of Bharatanatayam and of Yoga, Yamini will be using the grammar of Natyashastra and Yoga asana vinyasa to explore an unusual presentation in which she will attempt to create visuals for the otherwise chanted Vedic mantras. As a performing artist, Yamini’s performances are always new and thought-provoking, encompassing a wide range of spiritual and secular themes. Her penetrating perception of Indian mythology and philosophy enables her to dramatise and choreograph her subject of presentation with interesting insights. Staying within the rubric of classicism, Yamini explores ancient themes and narratives in a manner that refreshes intellectual and expressive depths for both dancer and audience. Having been a dancer for more than 35 years, a student and practitioner of Yoga for 22 years, she felt there couldn’t be a better way to combine the creative fire of a dancer with the spiritual desire of a yogini. While dance is an external form of presentation, where there will be audience and story-telling, yoga is an internal experience where the audience is you and your experience. “Siddhi” is one such exploration. Born out of an attempt to connect with, contemplate and celebrate the concept of the Universal Knowledge, Siddhi is set to selected hymns and verses from the Bhagavad Gita, the Upanishads and the Vedas. The choreography is unique, amalgamating two powerful disciplines to explain a concept. Complicated Yoga Asanas and graceful movements of Bharatanatayam makes this work interesting and captivating. The otherwise chanted Slokas are recited with movement, melody and stillness. The music has captivating Ragas, Swaras and Jathis to bring out the dance aspect and the quiet and soft rendering of Slokas bring out the energy and stillness of the Yoga. Breaking the choreography into 5 chapters, she explores the mind. “Siddhi” concept of Shriti, Sthithi and laya. “Siddhi” concept of Panchabhootha (five elements)- Bhoomi, Agni, Vayu, Jala and Akasha all generated by mind’s intelligence. “Siddhi” concept of Brilliance of Knowledge, as bright as a 1000 Suns together creating an intelligence which can be experienced only by the learned who can look through the kaleidoscope of light/ brilliance. “Siddhi” as the concept of mother, a protecter, a nurturer and a teacher who guides through knowledge. Concept of Sarvam Samarpayami, that is transcending “Siddhi” to Supreme Intelligence by surrendering ego. The Slokas are selected after intensive research and help by Dr. Girija Khanna and Prof. Balaji, English Professor and Sanskrit Pundit from the Mysore University. Should have learnt some form of Indian classical dance, as these are in Slokas. The leaning then can be adopted into the repertoire. Should be in practice for at least 5 years. Should have performance experience as the piece being learnt is ready for performance after putting in self practice. A few Jathis which are blending into the presentation. You will get the professional performance music which is recorded in studio. 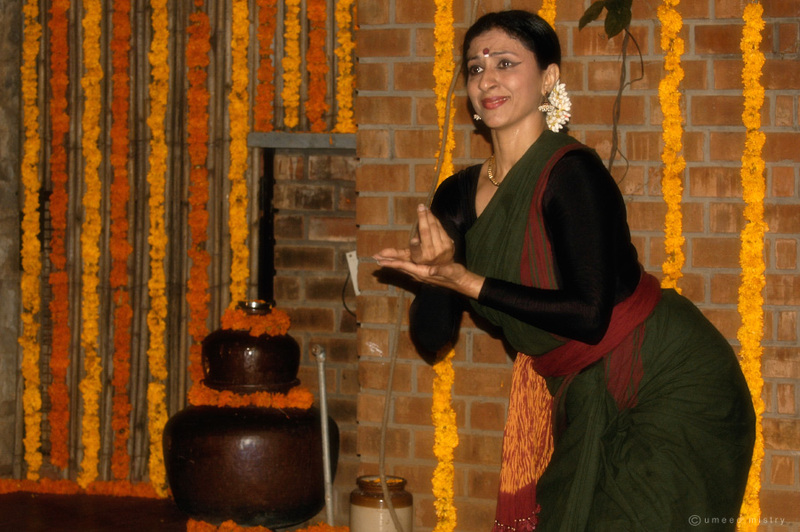 Siddhi is a unique and a creative production interlinking the spiritual aspect of yoga with the physical aspect of dance. Seamless transition from a graceful dance movement to a powerful yet elegant Yoga Asana. Journey into the spiritual aspect of a dance performance using the essence of Yoga. Blending of the external beauty of dance with the internal strength of yoga. As the music is based on Vedas, the entire experience of the production will be a metaphysical one.